To the soundtrack of thunderous monsoon rain, I learned these easy Malaysian recipes at the Mango Garden Restaurant in Borneo. Light, healthy and bursting with the zest lemongrass and coconut, they translate pretty well to kitchens back home in the UK. Here’s what the cooking class was like and how you can follow the recipes yourself. Updated 2019. I bundled my camera and notebook beneath the monsoon skies and scurried into the class, distracted by splatters of roadside mud and the thunder of rain on tarpaulin. Food so far in Malaysia had tasted so fresh and so delicately spiced. The clear soups and sauces disguised the strength of the flavours and carried a secret I thought I’d never manage to learn. Back home, soups come thick and chunky, with taste indicated by hue, the brighter the better. But how basic was basic? In other words, was it going to be basic enough for the likes of me? Oh, cover me in eggs and flour and bake me in a banana leaf for 40 minutes, it was. Happy days! Tasty days! Not only did the whole plan come together but (bar an ingredient or two) this menu did actually look like something I’d be able to do back home. Step aside Jamie Oliver. I’m coming home ready to impress. Unlike the other recipes, this one is generally reserved for high days and holidays. The rich canary yellow sauce brings a splash of colour to the plate and locals use it to dazzle at weddings or to celebrate the end of the holy month of Ramadan. 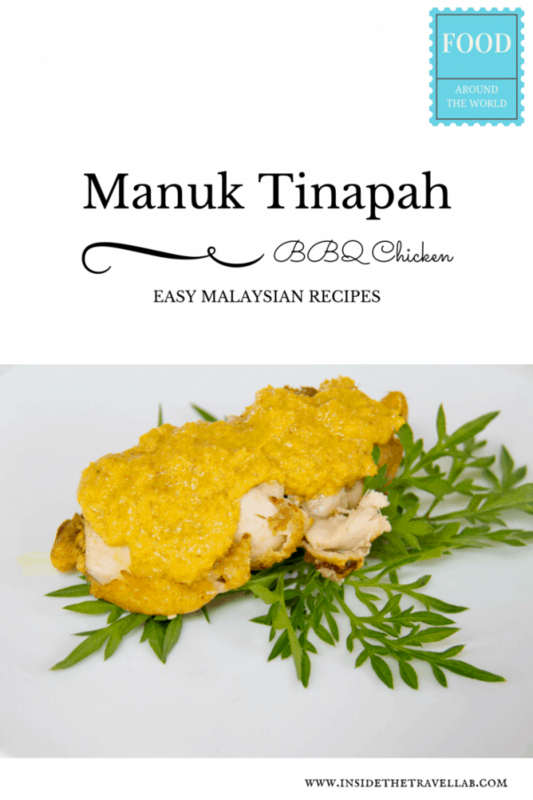 Manuk means chicken and Tinapah means BBQ in the local Bajau dialogues but, well, you know, Manuk Tinapah sounds cooler than plain old barbecued chicken. 200g boneless chicken, 30g garlic, 30g ginger, 40g mashed shallots, 30g galangal (root that’s similar to ginger,) 30g lemongrass, 15g turmeric, 20g saw leaves (hm, may need to resort to rocket in the UK,) 50ml coconut milk, 20ml cooking oil. Sugar and salt to taste. Pound the garlic, ginger, shallots, galangal, lemongrass and turmeric together to form a chunky paste. 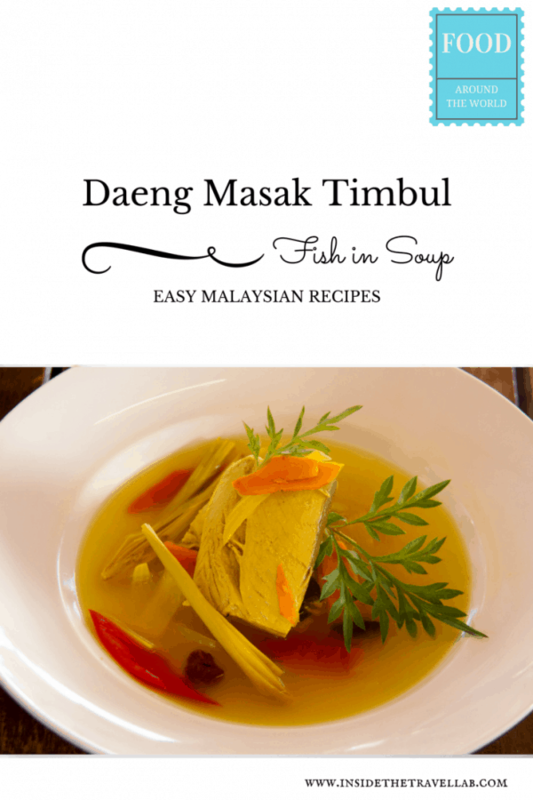 In a bowl mix in all the other ingredients, season to taste and marinate for around 10 minutes. Remove the chicken and put aside for grilling. Turn up the heat to medium high and reduce the coconut gravy to form a sauce. Pour the oil into a frying pan and cook the chicken until slightly browned and burned. Slice the chicken, set it on the salad leaves and then audaciously drizzle some sauce all over it and into a fancy spiral on the plate. The tradition behind this recipe involves stealth cooking on a boat – either from pirates evading capture or hardworking fishermen struggling to get by. Either way, this Ubian delicacy from northern Sabah is super fast, ultra fresh and with the low fat combo of lean protein and mixed veg, it’s ridiculously good for you. It even looks good when artfully arranged. Once the water is boiling, add the fish and lemon basil and boil until the fish is cooked through. Pour into a bowl and garnish. I love, love, love this kind of combination but if you’re at all uneasy at the sight or taste of “raw” fish then perhaps this isn’t for you. I’d urge you to give it a try, though, and you can rustle it up as either a starter or side dish or even (served with enough salad) as a summer main course. If you’re short on time, this can also be prepared the day before and left in the fridge ready to go. 200g Fresh Tuna Fillet, 67g Bitter Gourd, 17g Ginger, 34g Shallots, Red Chilli, 42ml Lime Juice. Salt to taste. Clean and finely slice the tuna fillet then marinate it with lime juice and salt. Mix everything together in a bowl and leave for at least 10 minutes. So, there you go. 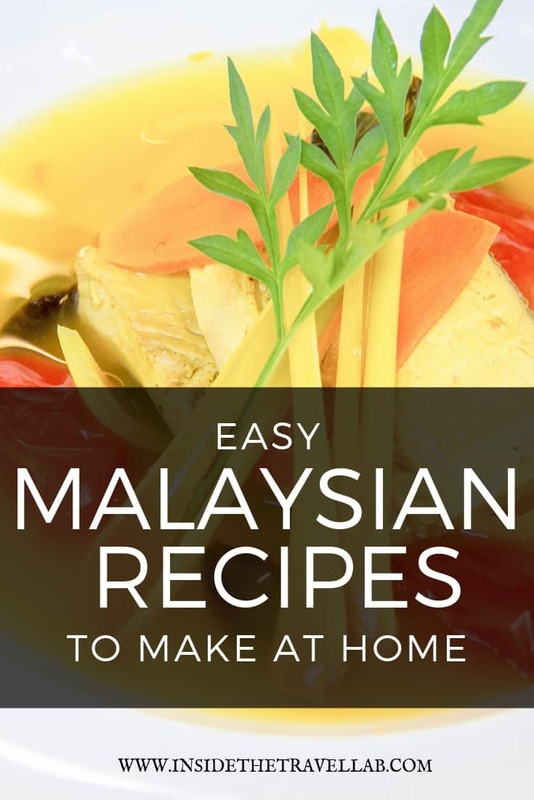 Three really easy Malaysian Recipes, recipes so simple that even I could make them look and taste good. Have a go yourselves and let me know how you got on! Disclosure: I visited the Mango Garden Restaurant as part of a project with iAmbassador, Sabah Tourism and Royal Brunei Airlines. As ever, as always, all words and thoughts and tastes and cooking experiences my own. Otherwise, there’s just no point. The pics are my own too and what’s more I made all the food myself! How about that?! 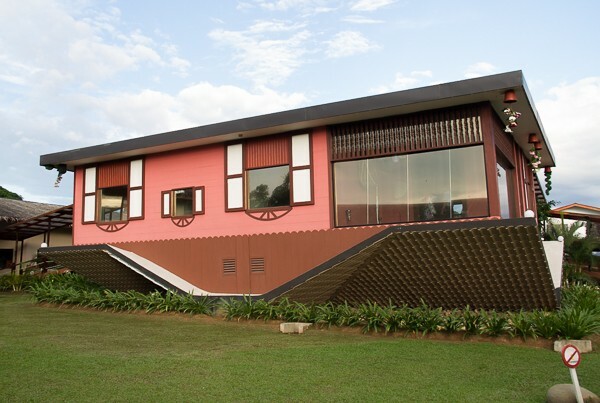 The upside down house looks crazy! That’s so cool! Hm…yes. Everything in there is upside down! (As in, stuck to the ceiling.) Quite interesting – but gave me a bit of a headache! These are great recipes that look so good and easy. I will have to try. Yep, they certainly are! Happy cooking! I love cooking classes too! 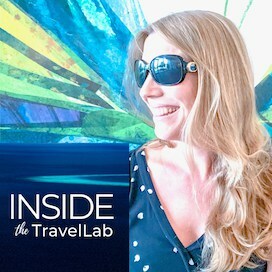 Malaysia would be a great place and I’m kicking myself for not doing it back when I was there. Next time for sure! I feel the same way about Thailand. One day! These look delicious! Sadly, I’ve only done one cooking class in my whole life, in Chiang Mai. It was so much fun though and I took the recipes home and recreated them over and over again for family and friends. I need more simple dishes to add to my repertoire, maybe I’ll give one of these a try! Ah, well at least you kept up with what you learnt! I have quite a stop-start mentality when it comes to cooking something new. I feel another resolution for 2015 creeping into view…! Me too I love cooking classes and learning international recipes. Looking through all of your great recipes I definitely will try the fish salad. Sounds so delicious. Thanks for sharing. I did this exact same cooking day at the Mango garden restaurant! The chef was amazing and the recipes so delicious and fresh! Aha! Small world! I agree – the chef was amazing. Your comment has just reminded me how I promised myself I would cook this when I got home…Need to get cooking!